The goal of ergonomics is to design jobs and tasks around the user's limitations and capabilities. To accomplish this, it is necessary for the designer to develop a clear understanding of how the equipment will be used, maintained, and even misused. The design of the system must incorporate the worker, equipment, and environment as a whole. Task analysis is one of the basic tools that an ergonomist has to design and evaluate systems. Task analysis is any process of assessing what a user does and why, step by step, and using this information to design a new system or analyze an existing system. The term task analysis refers to a methodology that can be carried out by many specific techniques. These techniques are used to describe or evaluate the interactions between the humans and the equipment or machines. They can be used to make a step-by-step comparison of the capabilities and limitations of the operator with the requirements of the system. The resulting information is useful for designing not only equipment, but also procedures and training. Why Should Task Analysis Be Used? Evaluation and design of a system using task analysis more effectively integrates the human element into the system design and operations. System design must consider the human as a component of the system to ensure efficient and safe operation. The entire system must be thought of as being comprised of the following components: human operator, equipment (hardware and software), and environment. The mining environment inherently places many restrictions on the system design, which makes it even more important to consider these three components as a whole at the design stage to design an effective system. This systematic analysis of the tasks required of the user can result in equipment that is safer to use, easier to maintain, and operated using effective procedures. When To Use Task Analysis? Ideally, a task analysis should be used when designing the system. By performing a task analysis early on in the system design, the user's capabilities and limitations can be incorporated into the design of the equipment, procedures, and training. However, it does not end here. Like the overall design process, task analysis is an iterative process. After the results of the task analysis are incorporated into the system design, it is necessary to perform the analysis again to ensure that the changes do not produce an unforseen consequence. In addition to providing useful information to incorporate into the design of system, task analysis information can be used to develop and improve the personnel and training requirements. Task analysis also can be used to evaluate an existing system. If a problem is identified or a new piece of equipment is added, a task analysis can be used to enhance the system. There are hundreds of task analysis techniques. 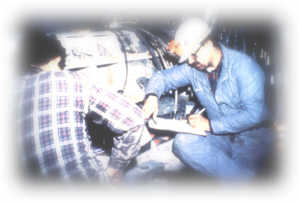 The mechanics used to carry out task analyses can range from observation to complex computer simulations. The desired type of information to be collected and eventual application of the information will aid in selecting the appropriate technique and how it should be used. For example, the goal may be to develop a new system, modify a existing system, or identify training requirements. Once the purpose of the analysis has been established, the type of information to be collected can be determined. An existing system can be the basis of the data collection if it is that system being assessed or if it is similar to a new system being designed. The design of a completely new system where there does not exist a system with similar relationships poses problems for the use of task analysis. In this case, it is necessary to use task synthesis. This requires referring to the proposed design of the system to produce a description of tasks to be performed that can be used as the focus of the assessment. After the type of information to be collected has been established, the type of format to present and analyze the information can be developed. In some applications, it may not be necessary to conduct a "complete" task analysis. The complexity of the system and the eventual application of the results will determine the level of analysis to be performed. To decide what type of information should be collected and how it should be gathered, it is necessary to identify the focus of the analysis. That is, not only what system is to be the focus, but also what the results will be used for, such as redesigning a new system, modifying an existing system, or developing training. For the system that is to be analyzed, it is necessary to identify the task information requirements. The table below presents some types of information that might be required. (2) The type of information required will help to determine the data collection technique. Identification of subtasks A listing of the activities involved with a task. Grouping of subtasks An organized, often hierarchical listing of the activities involved in a task. Commonalities and interrelationships between subtasks An indication of the extent to which subtasks have features in common and are linked to each other. Importance or priorities of subtasks Assessment of the criticality of subtasks. Frequency of subtasks Information on the relative frequency of occurrence of subtasks under different conditions. Sequencing of subtasks Information on the order of occurrence of subtasks under different conditions. Decisions made in the execution of subtasks Part of the sequencing may be based on a decision needed to choose the branch of activity and thus a given set of subtasks. 'Trigger' conditions for subtask execution Execution of a subtask may depend upon the occurrence of a particular event or a decision made in during a previous task or subtask. Objectives or goals of each subtask A key feature of an analysis is the recording of the objectives of each subtask. Performance criteria for each subtask Recording of objectives may include statements about performance criteria. Information required by each subtask The items of information needed and their sources. 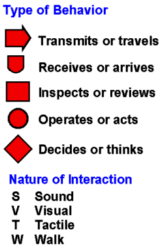 Information generated by each subtask Information that the user inputs into the system. Knowledge employed in making decisions Information that the user utilizes in decision making. Knowledge of system employed in performing subtasks Understanding that the user has of how the system functions. Within a given system, there is a job or jobs that are performed toward a common goal. A job can be broken down into tasks that must be executed in order to complete the job. Each of the tasks can be broken down into subtasks or steps. It may be helpful to consider that a job may have more than one person working to accomplish a mission and to define a task as a unit of the job that is completed by an individual worker where it would not make sense to divide it between two workers. Each task is made up of subtasks that are the steps taken to accomplish the task. Although jobs, tasks, and subtasks are defined differently by various people and for different applications, what matters the most is that there is consistency in these units and definitions within a given analysis. Observation Observe and record information about the worker performing job. May first observe the worker and subsequently ask the worker to provide verbal explanation while walking through the steps. Interview Ask the operator questions about job. Questions can be open-ended to learn more about the job. May conduct while worker is performing job or may do away from job site. Worker must know that the information collected will remain confidential and anonymous. Focus group Discussion with a group of typically 8 to 12 people, away from work site. A moderator is used to focus the discussion on a series of topics or issues. Useful for collecting exploratory or preliminary information that can be used to determine the questions needed for a subsequent structured survey or interview. Existing documentation Review any existing operating manuals, training manuals, safety reports, and previous analyses. Checklist Use a structured checklist to identify particular components or issues associated with the job. Available for a range of ergonomic issues, including workplace concerns, human-machine interfaces, environmental concerns. Questionnaire Use to collect systematically individual's views of a system or task. Questions should be structured, although can be open-ended. Videotape Tape the worker performing the job or specific tasks. Provides record of the job and ability to repeatedly study the tasks. As information is gathered through methods such as those described above, it will need to be documented. The raw data may be collected in note form; however, as it is collected, it will be necessary to record and present the information in a format that can be used to analyze and process this information. A simple and straightforward format that can be used to organize and record the collected data is a column format (see the figure below). With this type of format, the tasks and subtasks are listed down the left-hand side of the page and the information categories are listed across the top of the page. For each task or subtask, the task information collected is recorded throughout the page. An example of column formatting used for data recording. Other examples of formats that can be used to break down and present the task information include hierarchical diagrams, operational sequence diagrams, and timelines. A hierarchical format can be used to break down the tasks into subtasks. The top of the diagram lists the more general tasks, each in an individual box. Detailed subtasks that comprise each task branch off the appropriate task box. Operational sequence diagrams are used to show the sequence of steps and the relationships between them in completing the task. This method requires making a flow chart of the task using standard symbols to present the information. (see illustration of typical symbols used in operational diagrams) (1) Finally, timelines are used to define not only the sequence of steps that make up the task, but also the time that they occur and duration. This presentation is particularly useful when there are several workers and machines interacting and can help to identify when worker and/or machines are being overloaded or under loaded during the completion of a task. The final step is using the information to yield the basic data for design decisions. The details for 40 task analysis techniques are presented in "A Guide to Task Analysis" by Kirwan & Ainsworth. 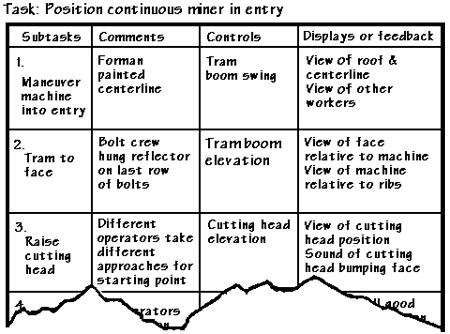 (4) Of these, five selected techniques that may be relevant to equipment design are presented in the table below; however, there are others that may be useful as well. Additionally, there are chapters and even books written for a given technique. The intention here is to present an overview of these five techniques. One of these techniques may be appropriate to do a simple analysis; however, more complex analyses may require additional resources or perhaps an expert to conduct the analysis. Hierarchical Task Analysis A broad approach to task analysis used to represent relationship between tasks and subtasks. Documents system requirements and order in which tasks must take place. Useful to determine how the work should be organized to meet the systems goals. Applications range from taking a global look at a system to looking at specific details of a system, such as interface design. Interface Surveys A group of methods used for task and interface design to identify specific human factors problems or deficiencies, such as labeling of controls and displays. These methods require an analyst to systematically conduct an evaluation of the operator-machine interface and record specific features. Examples of these methods include control/display analysis, labeling surveys, and coding consistency surveys. Link analysis Used to identify relationships between components of a system. Provides a means to represent the nature, frequency, and/or importance of links between components within a system. Operations sequence diagrams Used to illustrate relations between personnel, equipment, and time. Identifies operations in the order in which they are carried out using standard symbols. Flowchart represents information flow and behavior rather than the observable process. Timeline analysis Set of principles rather than a precisely defined technique. Used to map operator's tasks along time to take into account task frequency, duration, and interactions with other tasks and personnel. Sanders, M. S., and J. M. Peay. Human Factors in Mining. USBM IC 9182, 1988, 153 pp. Stammers, R. B., and A. Shepherd. Task Analysis. Ch. 6 in Evaluation of Human Work. Taylor & Francis Inc., 1995, 28 pp. Corlett, E. N., and T. S. Clark. The Ergonomics of Workspaces and Machines. Taylor & Francis Inc., 1995, 128 pp. Kirwan, B., and L. K. Ainsworth. A Guide to Task Analysis. Taylor & Francis Inc., 1992, 417 pp.